Offers butterfly, purple martin, bluebird, and bee houses. Gift certificates available. Bird cages suitable for all types of birds, from finches to macaws. Bird books in Spanish also available. Offering bird toys for small, medium and large birds, as well as bird food, cages and other avian accessories. Bird cages, play gyms, stands and bird toys made of stainless steel, manzanita, cactus wood, beads, cotton rope, sisal, chain and leather. Also offers bird health and information pages as well as hand-fed baby parrots. Bird toys for all sizes of birds. Also offers some bird accessories. Bird control devices to scare away pigeons, geese, and other nuisance birds. Birdhouses, nesting boxes and bird feeders made of polypropylene. Custom made bird cage covers. Many sizes available. Offering bird toys for all sizes of birds as well as toy making parts. Carved bird decoys and reproductions by Richard A. Morgan. Bird news, trip reports, birdwatchers county directory, and bird merchandise. Manufacture and sell Maine-made lighthouse bird feeders and accessories. Manufacturer and seller of bird playpens and other accessories. Located in Burton, Michigan. Large selection of toy making part. Bird cages and bird supplies. Offers 16 varieties of wild bird feed, custom blends, suet, and feeders. Selection of bird removal and deterrent products. Bird toys and perches for the smaller birds. Provides UK rare birds news, bird CD-ROMs, videos, books and other birdwatching products. Offers a variety of scales to weigh pet birds. Also carries thermometers for baby bird formulas. A source for books about birds and birding with an emphasis on conservation, ecology and protection of bird life. Wild bird mixes, including millet, niger, safflower, and sunflower seeds. Wholesale information available. Bird toys for all size birds, toy parts and cage accessories. Every bird toy is individually handcrafted and tested. Bird feeding supplies, baths, and garden accents. Also offers mounting hardware and pond accessories. Offers nest boxes, bird feeders, garden gifts and information on attracting wildlife to your backyard. Hummingbird and purple martin shelters, bird song identifying tips, and water garden supplies. Offering toys, toyparts, cage accessories, food and treats, cleaners, and books. Also bird themed merchandise. Designer and retailer of realistic tyvek bird kites and windsocks. Looks like youre flying a bird on a string. Based in Virginia Beach, VA.
Dog houses, bird and small animal cages, aviaries, kennels, hutches, bird and rabbit nest boxes, and related supplies. Bird carver site displaying original bird carvings and nature photography by Jim Podsiadlo. Live webcam of nesting Eastern Screech Owls. Offering all sizes of bird toys, hanging gyms, other bird supplies and gifts. Manufactures and sells the Parrot Tower play stands. Cages, toys, foods, specialty lines, and other supplies. Includes a bird education center covering behavior, nutrition, and environment. Workshop/store located in Danby village. Jim Kardas artist biography, bird house features, styles, photos, FAQ and online ordering. If the business hours of Backyard Bird Company in may vary on holidays like Valentine’s Day, Washington’s Birthday, St. Patrick’s Day, Easter, Easter eve and Mother’s day. We display standard opening hours and price ranges in our profile site. We recommend to check out backyardbird.com for further information. 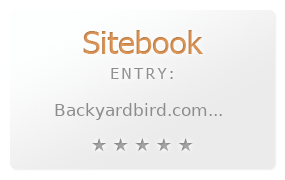 You can also search for Alternatives for backyardbird.com on our Review Site Sitebook.org All trademarks are the property of their respective owners. If we should delete this entry, please send us a short E-Mail.